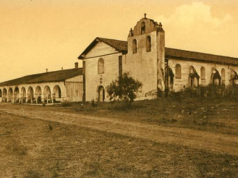 Mission Santa Cruz, located in Santa Cruz on the coast, was the twelfth mission in the chain. It was founded in 1791. 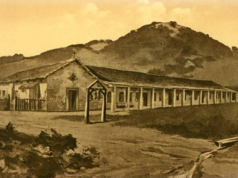 Although started in favorable conditions, a series of misfortunes prevented Mission Santa Cruz from real success and prosperity. The total population of the mission reached five hundred at its height. The greatest problem was the nearby pueblo, which was colonized by vagabonds and criminals. These early colonists were the opposite of “upright, God-fearing men”. The whole situation put a strain on the padres trying to convert the local Indians. 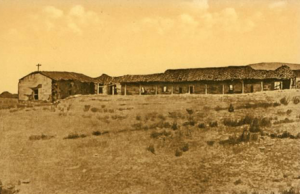 All the original buildings have disappeared except for one adobe building, which had been a soldier’s barracks. 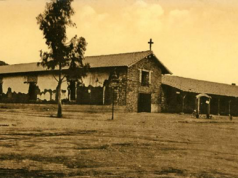 In 1931, a one-third sized replica of the original mission was completed. The small museum has relics of the early mission days and a collection of beautiful vestments worn by the padres. 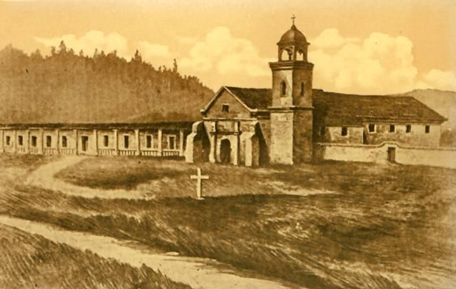 At one time, Santa Cruz mission had ten mission bells, valued at more than any others in the chain. The whereabouts of these bells remains a mystery.